Be inspired by Terry and Suus. Now known as Mr & Mrs Snow van Putten or you can call them van Putten Snow. I recently had the honour of conducting and singing at their tropical wedding. It took place in the heart of Amersfoort, the Netherlands. The union of this very special couple, will prove to you that it is never too late to fall head over heels in love. 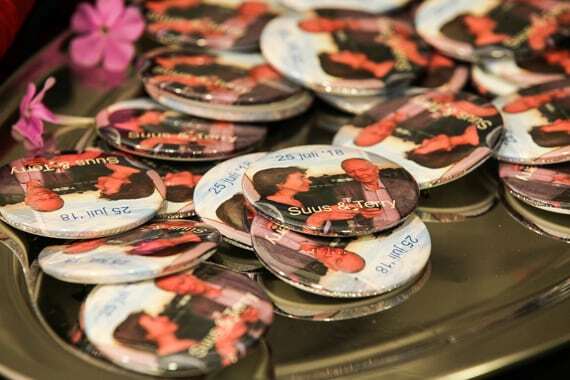 Keep reading Mr & Mrs Snow van Putten and van Putten Snow’s real life wedding story. Terry and Suus are a mature and exotic couple. They were tying the knot for the second time. He is from New Zealand and she is Dutch. And Amsterdam is their hometown. This active team loves nature and spending quality time together. 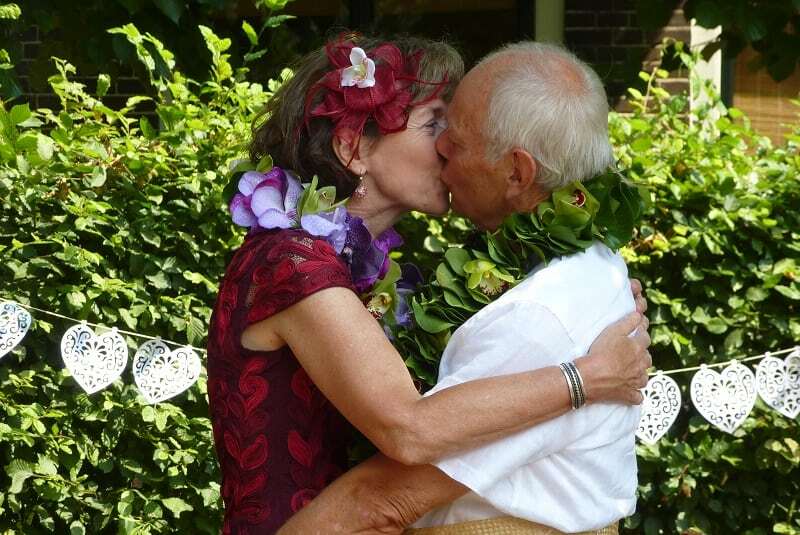 Their small intimate tropical wedding day was a fun fusion of New Zealand and Dutch traditions. Four years after they met in 2014 at Amsterdam’s annual spectacular New Year’s Day concert in the Concertgebouw, Terry invited Suus for a special meal. It was Valentine’s Day 2018. Suus thought something was in the air when she received a lovely floral corsage and the night began with champagne. It was an extremely hot day at the Cultuurboerderij Nieuwe Erven, city farm. In the heart of Amersfoort, Holland the little piece of countryside was a welcomed change to a busy bustling urban life. Set amongst a residential area it oozed tranquility and peace. The happy couple made a conscious decision to choose this outdoor facility. Suus’s sister and David her partner are the proud managers of the rustic bohemian-style wedding venue. It was an idyllic backdrop for their first pictures. 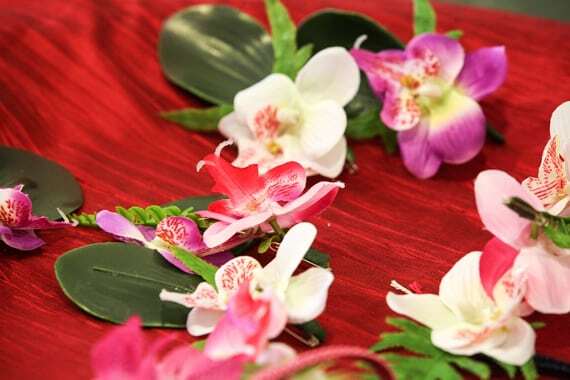 Moreover, Terry and Suus’s tropical wedding theme inspired by Dutch and Kiwi customs. So, we met in my local bar De Tuin (the garden). It was convenient for all of us and we discussed their plans and wishes. We got on like a house on fire. Writing the marriage service script was pure pleasure. We revised more than 10 drafts to get it right. Terry and Suus let me in on secrets and took me down their romantic memory lane. But they kept some things private. Nevertheless, they had an incredible story to share. They have so much in common. She enjoys reading and he loves cooking. And both of them love cycling through the Dutch countryside and travelling together. With the input they gave, we created a warm, inspiring and personal speech full of spicy stuff, sheer sentiment and joy. We added a surprise music element as well. Under the sweltering sun of the Dutch sky, they thanked family and friends for making the effort to come to the wedding. We also took a moment to remember absentees and loved ones. And this caused a few tears and sighs of sorrow. It was sizzling hot. Wedding fans kept the guests from overheating. Most importantly, they remained cool and comfortable. Afterwards, Suus and Terry uttered their vows and said, “I do”. Next, a registrar from the town hall of Amersfoort ensured registration and the signing of the official marriage certificate. 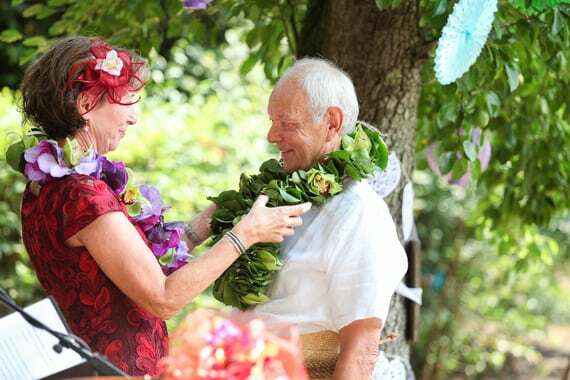 Terry and Suus chose to seal their vows by exchanging leis instead of rings. The beautiful purple, green and white orchids for Suus and green foliage and orchids for Terry represented Terry’s link with the Pacific and his strong family connection with the island of Tonga. 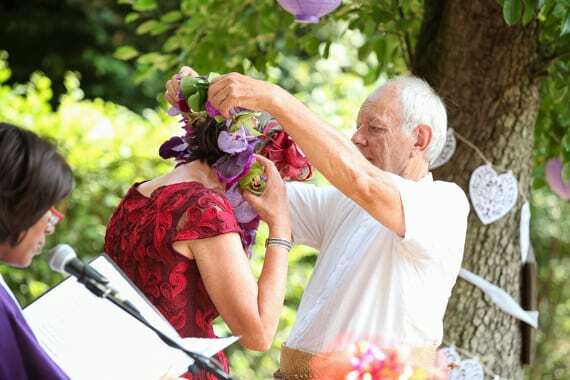 They are a traditional symbol of love, friendship and celebration, which Terry was adamant about sharing with Suus to unite their lives together. Terry and Suus, decided not to have personal vows but opted for the English vows instead. Translated into Dutch, it read: To have and to hold from this day forward, etc. Then, the ultimate moment of the ceremony arrived, and I said, “You may now kiss each other.” Family and friends began to cheer and clap, as Terry and Suus embraced in a loving kiss. 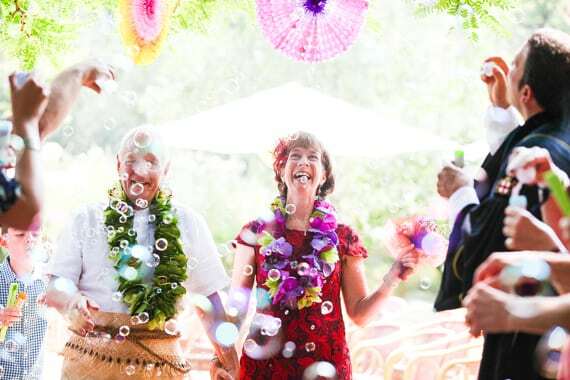 It was a happy end to their tropical wedding on one of the hottest days of the year. Groom’s attire: Traditional Tongan dress, lavalava skirt and ta’ovala fine mat. Thank you for conducting a wonderful ceremony for our wedding. It was such a happy day with everyone there to witness and celebrate the occasion. Suus and I are still buzzing from the whole event. So glad you stayed on to have the good food and experience the friendly conversation, happy guests and lovely atmosphere. Suus and I are still talking about what a wonderful wedding we had and how happy we were with everything. 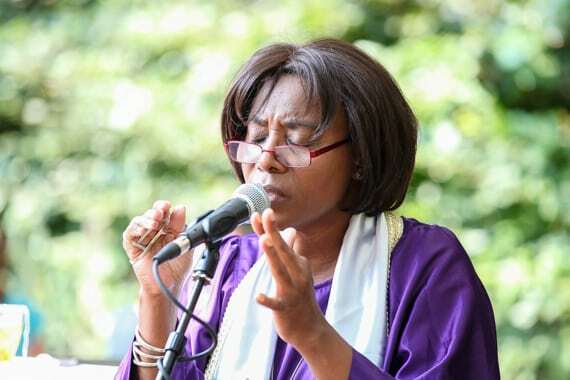 Once again, you were marvelous as a wedding celebrant and singer. Thank you so much.